my husband tells me that this quilt looks like picture frames, so that will be it's name. i took my sewing machine pedal to the shop, and they fixed it in 5 minutes--no big deal. i was happy. this quilt was started forever ago (seems like it, anyway). my sisters and i did a fabric swap last summer and i finally got a quilt made out of it. i'm really liking it. i'm not in love with the back (particularly the daisy print), but i am happy that i used that huge piece of fabric up and it's no longer sitting on the shelf for me to wonder what i will ever use it for. Your quilt looks great and it does have the perfect name. I agree the daisy print on the back is lovely. Well done! How do you make the blocks look like they are floating on top of the white background? I would love to use that effect in a quilt sometime. Great work! I always love to see what you've made! I was wondering how this was done too. It really looks great. I love the colors on that white background. Wonderful! I love all the frames randomly arranged on the quilt. Great look! Are you kidding me?!?! I LOVE that daisy print!!! What's it called and where can I get some??? I think the daisy print is gorgeous! I love how they look like they're floating! So pretty! That quilt is so pretty ... love it ... reminds of the movie "Sarah, Tall and Plain"
Love the backing fabrics. Do you know the offcenter 4 patch for backings .... it gives such interest I think. Congrats on a beautiful, quiet, loving quilt ... it's perfect. That's my kind of quilt! Hope you are still feeling well with the pregnancy. Freakin' beautiful!! Love love love. i LOVE your picture frame quilt, it is adorable and i love the colors on the white! what are you talkin' about? that backing is awesome, I love it! and the quilt is superb! Love it!! Back and front. The 'frames' are a fantastic effect. Well done. I love the quilt. I think the daisy print looks great--for the back--and it's such a good way to use up big chunks of fabric that you might not want to put on the front. Really cute quilt with great colors. Your finished quilt is really gorgeous! I love the colors and the displaced squares and your quilting job......the back is great too. I would love to make a quilt like that. Love it! 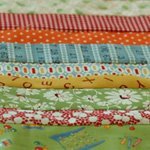 It is an amazing example of free motion quilting! This is beautiful! I love it! How in the world do you make this? It looks so complicated having the complete randomness. Stunning! One of the prettiest quilts I've ever seen!! So pretty!!! I love this quilt! I'm going to have to do this when I next find myself with plenty of scraps :) Glad your pedal got fixed quickly... I'm always terrified when something like that happens! Very cute. Good job for using from your stash. That is such a good feeling! 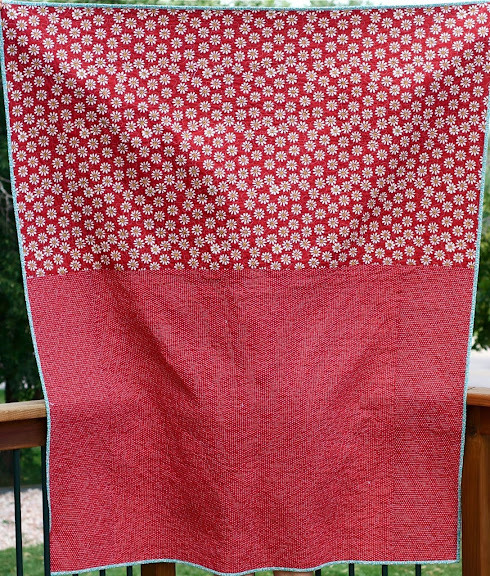 I love your finished quilt and the backing is perfect for it. This is so cute! And what a perfect name! I think it's great! Really fresh and modern looking. I'd love to know how you made it too! I love the floating frames! It looks great. This quilt looks wonderful.The design is great! It turned out so nice, and I really like the daisy print on the back! Nettie, this is amazing! Did you use a pattern for this one? oh I love this quilt too! oh nettie, I just love it! I loved it when you first posted about it, and i love it even more now that it's all finished! Great design, great colors - so beautiful! I love that close-up shot of the cherry fabric. That is what I find so great about quilts. They are something amazing when standing back and looking at them, but when you look close, at the bits of fabric, the stitching, the detail...oooh! I too am curious about the floating effect. It looks wonderful! it is a lovely quilt...the back is even pretty! I'm also interested in how you created that effect. I've done some work lately with white backgrounds and I love it, but the seams are so visible and it distracts me a bit. I don't think there's any way around this, but I'd love to hear more about this technique. I think this quilt is gorgeous! The color you used work so well together and the overall feeling is so fresh! How flippin cool is that quilt? I love the blue and red... and the back isn't bad either! Really! LOVE the simple design... one of my new favs! I love your quilt! I seriously need to make one like that. And the crinkly quilt after it's all washed and dried is wonderful! Good job! I am glad your machine is working for you now! I really am digging the red and teal colors together. The frame name fits it to a T.
Lots of white and specks of color... really cute! 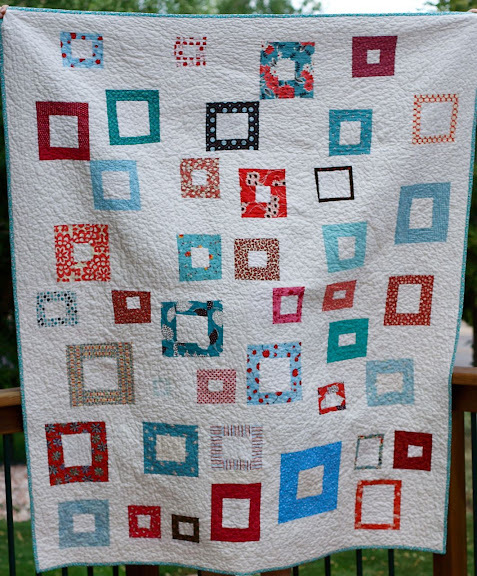 What a fun quilt - did you place the frames randomly to piece it in rows? Looks wonderful! Picture Frame is just beautiful!!!! i LOVE it! the randomness is amazing to me. it's great!!! I love it! The daisies are darling! Did you use a pattern? It's beautiful! Very nice work. Love, love, LOVE it! Love the colors, and the spontanaeity! Beautiful! Oh my....it's just precious.....AND I'm ga-ga over your spiderweb too!! omg! I think that the pattern is awesome! where in the world can i get it? How on earth do you make a quilt like this? Is it terribly hard to piece with all the frames all over the place? I would love to know. 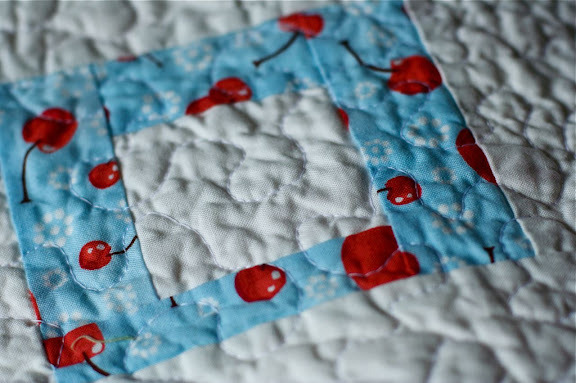 I really love the quilt - blue and red are becoming a fast favorite combination of mine~! I love the colours in this cheerful quilt! LOVE this quilt. 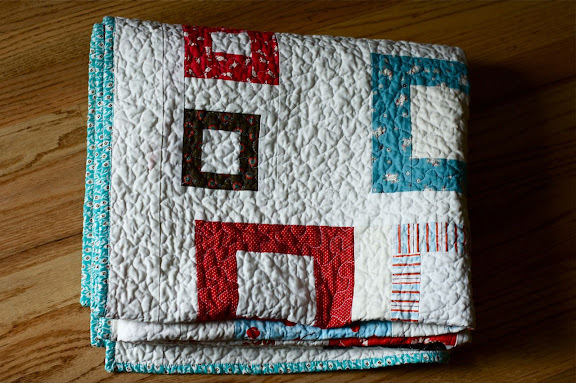 I am always looking for quilts that I can use up scraps in, and this would be perfect. It's always nice when you can use up some of your stash -- to make room for more, of course.